Nexus Gold (TSXV:NXS,OTC:NXXGF,Frankfurt:N6E) is a Vancouver-based exploration company focused on gold development projects in premier mining and exploration districts. The company holds the Niangouela Gold and Bouboulou Gold Concessions in Burkina Faso, West Africa, and the Walker Ridge project in Nevada. The Niangouela Gold Concession has been a key focus for Nexus Gold in 2017. The company began a Phase One drill program in January with plans for a Phase Two drill program later in the year. Located in the same gold belt as Niangouela, the Bouboulou Gold Concession is a near-surface, advanced-stage exploration target located in a known gold belt. Nexus Gold has completed a compilation of historic exploration data, identifying three new distinct anomalous gold trends. Pro-mining Burkina Faso is one of the largest gold-producing countries in Africa. The country was ranked fourth in the continent and 23rd globally in the Current Mineral Potential Index in The Fraser Institute of Canada’s “Survey of Mining Companies 2014.” There are currently seven gold mines in production in the country, which has excellent geological potential. With less than 15 years of modern mineral exploration, Burkina Faso remains under-explored compared to neighboring Ghana and Mali. Walker Ridge is a drill-ready, multiple-target, a Carlin-type gold exploration project located in the Independence/Jerritt Canyon Gold Trend, an established, multimillion-ounce gold trend and one of five major gold districts in Nevada. Nexus Gold has spent $1 million in development work at Walker Ridge since 2012, including the first-ever drill hole that returned gold and silver mineralization in the lower plate host rocks. Three new distinct anomalous gold trends were recently identified at the Bouboulou Gold Concession in Burkina Faso. Previous drilling at Bouboulou confirmed multiple zones of gold mineralization, establishing both length and grade. Recently acquired the Niangouela Gold Concession in Burkina Faso. Phase One drilling is underway and Phase Two drilling will follow. 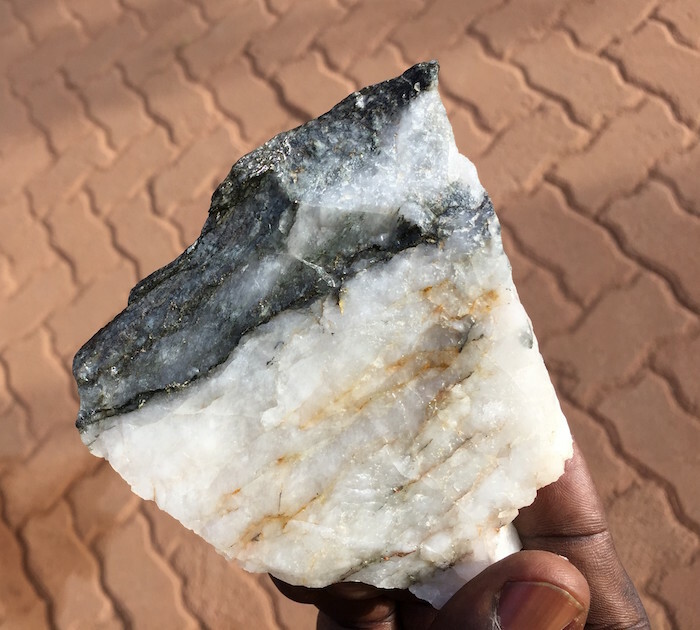 Sampling at Niangouela has established the presence of high grade gold mineralization, with values as high as 2,950 g/t. The first drill holes at the concession have now confirmed high grade gold mineralization, highlighted by a 4.85 meter intercept of 26.69 g/t gold, including 1 meter of 132 g/t gold. Nexus Gold’s Niangouela Gold Concession covers 178 square kilometers and is located in the well-known Boromo Greenstone Belt. It is road accessible, and has one major artisanal working. Previous work on the Niangouela Gold Concession includes a total of 1,137 rock and soil samples taken from 556 pits and 11 trenches. Rock samples have returned values up to 18 g/t gold and trenching has returned values of 4.85 g/t gold over 10 meters. Work completed by a previous owner also identified a zone that runs ENE and WSW in the south-central part of the concession. This zone has returned gold-in-soil samples up to 34 g/t gold. The company completed sampling and an 800-meter Rotary Air-Blast (RAB) drilling at the Niangouela Gold Concession in December 2016. This initial work was designed to test the top 30 meters of saprolitic rock, and results began to come back in January. 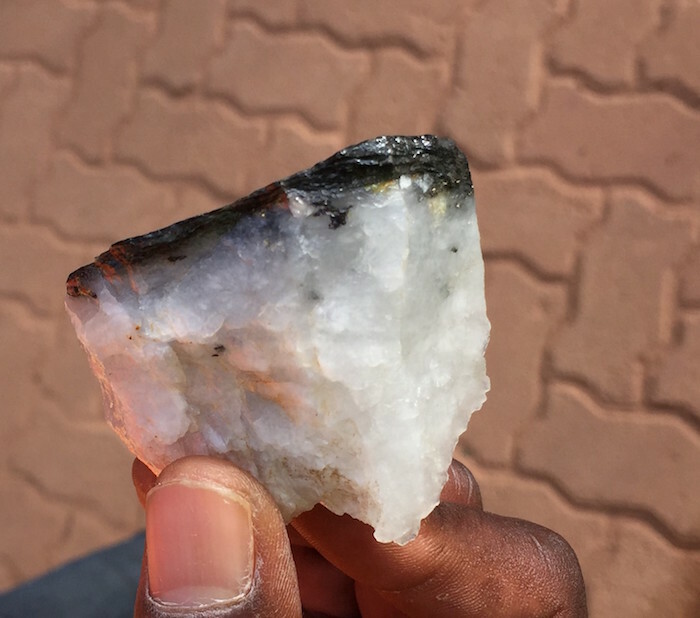 High-grade quartz vein sample NG005 from 46 meters below surface in an artisanal shaft returned a value of 2,950 g/t Au. Sample NG006 collected from the artisanal dumps of the sheared intrusive, returned a value of 23.9 g/t Au. Sample NG007 taken from material extracted from an artisanal shaft at a depth of approximately 60 meters, returned a value of 403 g/t Au, and sample NG008 taken from another shaft 10-12 meters away from NG007, returned a value of 49.8 g/t Au. 1.80 g/t gold over 5.10 meters (including 6.14 g/t gold over 1.10 meters). 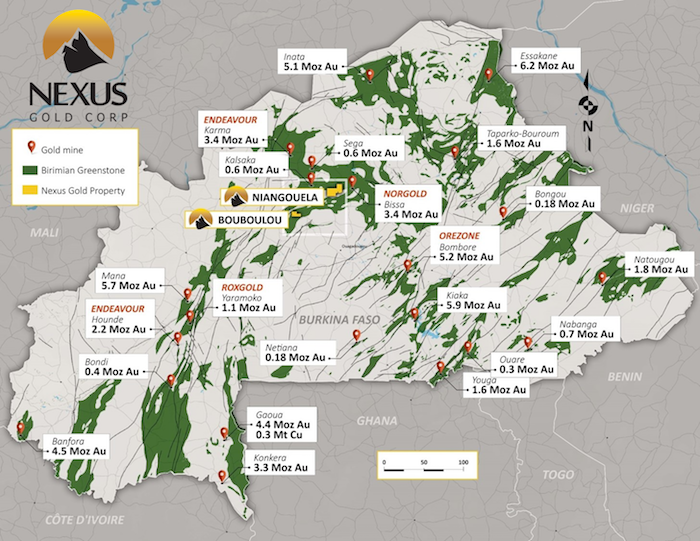 Also in March, Nexus Gold announced plans to begin a Phase Two drill program at the Niangouela Gold Concession. “This second phase will continue to effectively define the shear zone structure and the quartz vein within it. We will also investigate any potential higher grade shoots and preferred mineralization trends occurring along strike,” Berdusco said. The Bouboulou Gold Concession covers an area of about 38.8 square kilometers in the Boromo Greenstone Belt, about 75 kilometers northwest of the capital city of Ouagadougou, Burkina Faso. Bouboulou a near-surface, advanced-stage gold exploration project and features four zones of gold mineralization: Koala, Rawema, Bouboulou 2 and Pelgtanga. The property is bisected by the Sabce Shear Zone, host to numerous artisanal gold zones over a length of 120 kilometers and Norgold’s nearby Bissa Mine. Nexus Gold has the option to earn up to 100 percent interest in the Bouboulou Gold Concession. Previous exploration programs on the site discovered surface rock sampling and trenching returning gold grades from 1.09 to 19.16 g/t gold. In 2011 and 2012 Roxgold conducted diamond drill and a reverse circulation drill programs at the concession, then called Bissa West. The best results included (RC) 1.54 g/t gold over 40 meters, including 2.25 g/t gold over 20 meters; 2.20 g/t gold over 35 meters, including 5.40 g/t over 12 meters; and 2.84 g/t over 10 meters. The diamond drill program highlights include 12.53 g/t over 4 meters and 4.62 g/t gold over 6 meters, including 81.32 g/t gold over .3 meter. In October 2016, Nexus completed a compilation of historic exploration data at the Bouboulou Gold Concession, identifying three new distinct anomalous gold trends. All three trends extend from the four mineralized zones that have been identified at the property. Each of the three trends extends in length for 5000 meters (5KM). They are identified by numerous orpaillages (artisanal workings) and geochemical samples of greater than 1 gram per tonne gold. Prior to that, in September 2016, Nexus Gold discovered a new zone at Bouboulou due to an increase in artisanal mining activity. Eight grab samples were taken in the four known gold zones with six of the eight returning gold values, including 2.8 g/t gold and 5.5 g/t gold respectively at Bouboulou 2. Nexus Gold is planning a 2000 meter Phase One drill program at the Bouboulou Gold Concession. For the past 20 years Peter Berdusco has been an investor, business consultant, senior executive and board member in the public and private markets. Over the last 10 years, through his private consulting firm Berdusco Enterprises, he has fulfilled executive management, corporate development and strategic planning roles. Further to this, he has successfully raised financing for junior public companies including GFK Resources and Midnight Sun Mining Corp. His experience as a board member includes a founding directorship with Giantstar Ventures, a TSX Venture Capital Pool Company, which successfully acquired Chalk Media Corp. In 2009 he founded as senior partner, Falcon Point Capital Partners, a firm specializing in capital services for publicly traded companies. Alex Klenman brings over 25 of business development, marketing, finance, media and corporate communications experience. He has held senior management positions in both the public and private sectors. Since 2008 he has served as a communications consultant for several TSX-V listed resource companies, including among others Roxgold and Forum Uranium. Klenman also spent ten years in broadcasting, which included notable board positions with CKVU Television in Vancouver and Canwest Pacific Television. Warren Robb graduated from the University of British Columbia in 1987 with a Bachelor of Science in Geology and brings over 25 years of mineral exploration experience to Columbia Star Resources. Robb has worked for both senior and junior mining companies and has extensive operational and drill program management experience ranging from small preliminary testing to expansive programs for ore reserve definition to mining operations. Robb has managed exploration programs for precious and base metals throughout Canada, the United States, China, Africa and South America. In 2012, Robb served as Chief Geologist for Roxgold, where he supervised both field exploration and the diamond drilling program on the company’s Yaramoko gold property in Burkina Faso, West Africa. Mr. Stevens is a CFA charter holder with over ten years’ experience in the capital markets, first as an Investment Analyst with Salman Partners Inc., then as a merchant and investment banker. While at Salman Partners, Mr. Stevens became a top-rated analyst by StarMine on July 17, 2007 for the metals and mining industry. Over the course of his career, Mr. Stevens has been instrumental in assisting in financings and M&A activity worth over $1 billion in transaction value. Michael Kinley received his Bachelor of Commerce degree from Mount Allison University in 1971 and his Chartered Accountant designation in Ontario in 1973. He earned his designation with KPMG, where he spent 20 years (1971-1991), the last 10 as a partner. During the past 20 years Kinley has served as an officer/director for a number of resource companies listed on the TSX and TSX Venture Exchanges, including Cardero Resources, Wealth Minerals, Indico Resources, International Tower Hill Mines, Dorato Resources and Trevali Resources. Douglas Oliver is a career geologist who received his Bachelor’s degree in Geology from Rutgers University, an MBA from the University of Texas at Austin, and a PhD in Tectonics from Southern Methodist University. His more than 30 years in mineral exploration has focused on precious metals in the western United States, particularly in Nevada, as well as Alaska, Canada, Mexico, Latin America and Africa. His Nevada experience includes Senior Geologist positions with Occidental Minerals and Tenneco Minerals and he has consulted for over half a dozen companies on projects and acquisitions across the state. As VP of Exploration for Meadow Bay Gold, Oliver led in the discovery of Nevada’s first porphyry-host gold deposit at the Atlanta Project. *Disclaimer: The profile provides information which was sourced and approved by Nexus Gold in order to help investors learn more about the company. Nexus Gold is a client of the Investing News Network (INN). The company’s campaign fees pay for INN to create and update this profile page, to which links are placed on Investingnews.com and channel newsletters.